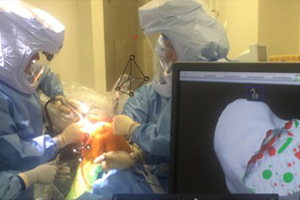 Dr. Nessler is using the newest technology available including computer assisted hip and knee navigation in his hip and knee surgeries as well as his joint revisions. He has been involved in training orthopedic surgeons from across the country in the use of computer navigation. Doctors performing total hip replacements at the St. Cloud Surgical Center are relying less on the imperfect human eye and more on the precision of robotics. St. Cloud Orthopedics surgeon Dr. Joseph Nessler, who performs between 400 and 550 hip replacements a year between the surgical center and the St. Cloud Hospital, said this technology will ensure a perfect fit and allow maximum mobility for patients.